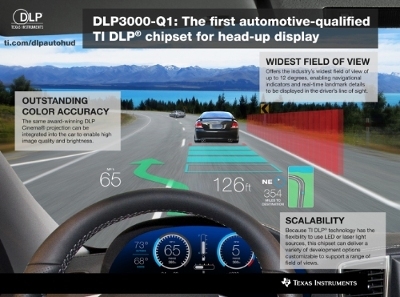 Bangalore — Texas Instruments (TI) (NASDAQ: TXN) today introduced the first DLP® chipset engineered and qualified for automotive head-up display (HUD) applications. Combining the award-winning imaging qualities of DLP technology with automotive reliability, the new chipset enables head-up displays with the industry’s widest field of view (FOV) up to 12 degrees. It also enables high brightness, color and contrast levels and provides manufacturers with a scalable platform. For more information, see www.ti.com/headupdisplay. The flexibility of the DLP3000-Q1 allows for the industry’s widest FOV HUD range, up to 12 degrees. A wide FOV HUD of this range allows augmented-reality elements such as navigational indicators and real-time landmark details to be displayed in the driver’s line of sight – with a depth perception of 2 to 20 meters ahead – to help keep the driver focused on the road. A HUD based on the DLP3000-Q1 features the same core technology that powers more than eight out of 10 digital movie theater screens worldwide. This results in a HUD capable of producing 15,000 candela per square meters (cd/m2) of brightness, a dynamic dimming range of 5,000:1, high contrast >1,000:1 full on/full off (FOFO) and 125 percent National Television System Committee (NTSC) color-gamut performance that will not degrade over temperature for clear images in various viewing scenarios over the typical life of the vehicle. In addition, DLP technology does not require polarization of light which helps automotive original equipment manufacturers (OEMs) design in HUDs with displays that are visible while wearing polarized eye-wear. Because DLP technology is light source-agnostic, it can leverage reliable light-emitting diodes (LEDs) while providing a future path to using lasers once they are available for automotive-qualified HUD applications. In addition, with the DLP3000-Q1 as the core component of the HUD picture generation unit (PGU), the whole system can be integrated into a variety of mechanical form factors such as a windshield or combiner HUDs. This is possible, across vehicle model lines, potentially resulting in greater returns on manufacturers’ investments. To accelerate end-product development, TI maintains an extensive ecosystem of design houses. The DLP Design Network provides developers a diverse network to support their hardware and software integration, optics design, system integration, prototyping, manufacturing services, and turnkey solutions to support current and evolving customer needs. 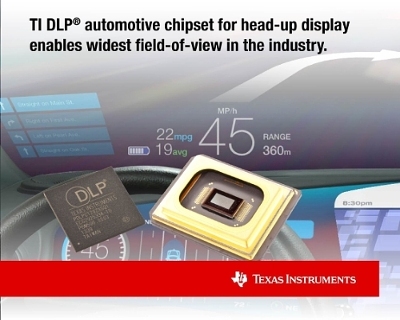 The DLP3000-Q1 chipset for automotive HUD applications is sampling now with automotive manufacturers and tier-one suppliers. The DLP 0.3-inch WVGA DMD will be offered in a Type A package and the DLPC120 will be available in a ZXS package. View a videodemonstrating the application areas for the DLP3000-Q1. View theoverview page for details about the chipset. Learn more about TI’s innovativeautomotive portfolio. Visit theDLP Design House Network. Since 1996, award-winning TI DLP technology has powered the world’s top display devices to deliver high-resolution images rich with color, contrast, clarity and brightness for a wide range of applications, including industrial, automotive, medical and consumer market segments. DLP technology is being used in movie theaters (DLP Cinema® products) and large-scale, professional venues and conference rooms, classrooms and home theaters. With mobile devices enabled by DLP Pico™ technology, users have the ability to display images from the palm of their hand. Every DLP chipset features an array of microscopic mirrors that switch on and off up to 10,000 times per second. To learn more, please visit www.ti.com/dlp or follow TI DLP technology on Twitter at@TI_DLP. TI’s state-of-the-art semiconductor products allow manufacturers and system suppliers to deliver world-class features to the automotive market. Our extensive automotive portfolio includes analog power management, interface and signal chain solutions, along with DLP® displays, ADAS and infotainment processors, Hercules™ TMS570 safety microcontrollers and wireless connectivity solutions. TI offers SafeTI™ parts designed to facilitate OEMs’ compliance with the requirements of ISO 26262, as well as parts specifically designated as compliant with the AEC-Q100 and TS16949 standards, all with excellent product documentation. Visit TI’s Automotive page or TI E2E™ Behind the Wheel Blog to learn more about our commitment to automotive innovation. DLP and DLP Cinema are registered trademarks and TI E2E, Pico and SafeTI are trademarks of Texas Instruments. All registered trademarks and other trademarks belong to their respective owners.